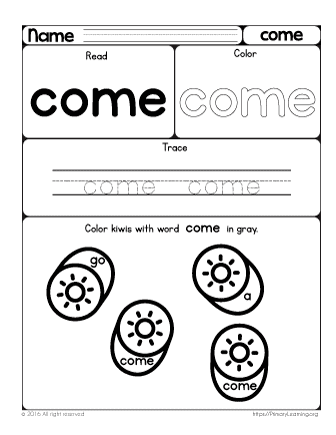 Sight word come is one of the common words kids start learning in the preschool. Recognizing these words by sight is a fundamental skill. This worksheet designed specifically for young learners and will not take a long time. At this age, kids get bored quickly. Keep them engaged with our hands-on activities. Looking for more hands-on activities? Check these pre primer words playdough activity mats.